A few days ago, we saw a handsome red-winged blackbird, with its distinctive red and yellow shoulder bars, happily chirping away in a tree in a backyard. Then, like something out of Alfred Hitchcock’s The Birds, it dive-bombed towards us, shrieking as it spread its wings and raised its talons. Frightened, we ran inside—ceding the backyard to our winged foe. If, like us, you’ve recently been traumatized (or embarrassed) by a red-winged blackbird, don’t worry: you’re not alone. 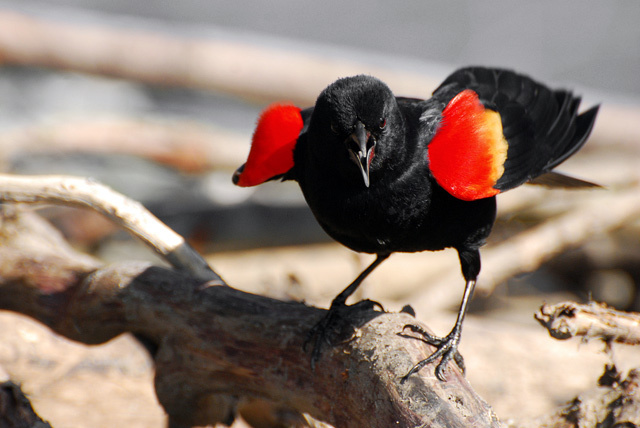 Red-winged blackbirds are mostly migratory; they spend their winters in the southern U.S. and Central America, and their summers mating in the northern U.S. and southern parts of Canada. “Shortly after breeding season, at the end of June and into July, most of their chicks will have hatched and left,” explained Toninger. “Then they will no longer defend their territory.” Until then, the best way to avoid their wrath is to stay away (they usually like to nest near water). If it’s about to swoop, don’t run away, look directly at it, and remember, even if it’s being a bother, don’t attack it. It’s a criminal offence to intentionally harm a bird in Canada. In addition to a $2,000 fine, offenders can also face six months imprisonment, not to mention a Dave Winfield–style reputation.